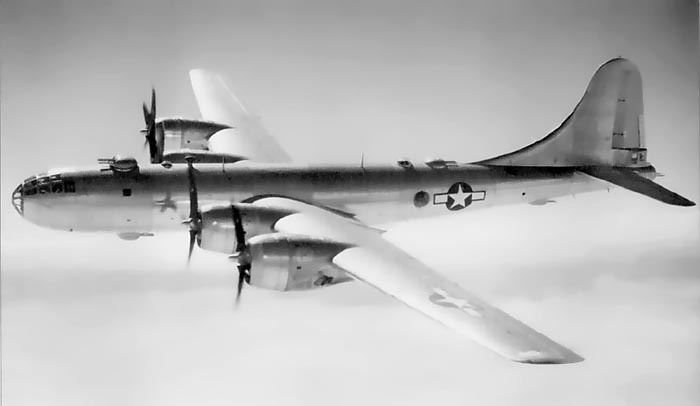 They flew the sparkling new Boeing B-29 Superfortress. The Queen of the skies. A truly marvelous aircraft. The reason they were able to fly this aircraft at all is 100% attributed to the Ground Crews that supported the 330th. It did not matter how great of an Airman you were. If your B-29 could not fly.., then you could not fly. These men rarely received the credit for their jobs. They just worked day after day, night after night, sweating in the heat of these islands. Sweating in carpenter shops, machine shops, sheet metal shops, engine repair shops, on the flight lines and crawling in every tight little corner of every bomber. They were masters of ingenuity. 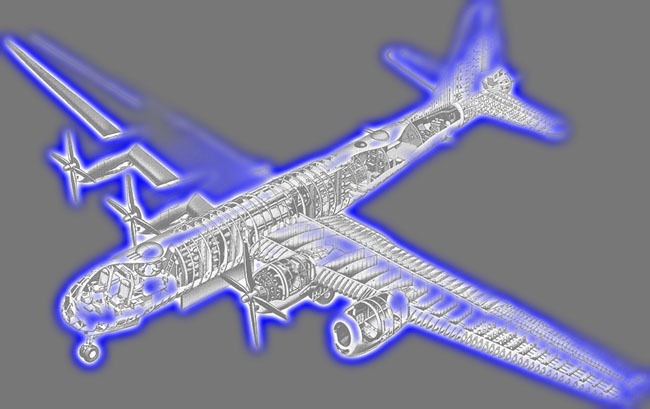 They invented gadgets and trick machines to cut down the time required to repair the myriad mechanical impossibilities that made these B-29's fly. 180 x M47 IE (Incendiary Explosive) @ 70 lbs each. 40 x M69 IE @ 500 lbs each. These were composed of 80 individual 'sticks' set to break loose from the bomb canister at preselected altitudes over the target area. This was LeMay's baby, scattering napalm for miles. 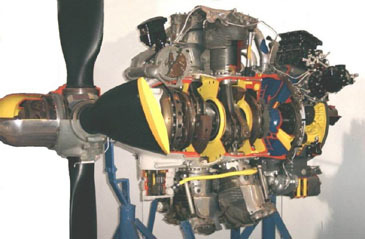 *The R-3350 is a twin row, supercharged, air-cooled, radial piston engine with 18 cylinders and a displacement of 3,350 cubic inches. Horsepower ranges from 2,200 to over 2,800, depending on the model. Crew: 11 Bright young men! The 11 man crew made up a full complement for the B-29 Superfortress. Click on the various positions above for a tour. No matter how you look at her! This was the scheme up until mid July 1945. 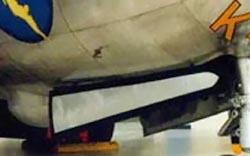 The "K" on the horizontal stabilizer was BMF (Bare Metal Finish). After that date you could begin to see them with bright yellow paint (almost orange). An additional bright yellow stripe was added to the "Lead Crew" designation as well. See below. 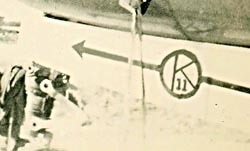 The outboard engine cowlings on both the port (#4) and starboard (#1) also received the Aircraft Number. 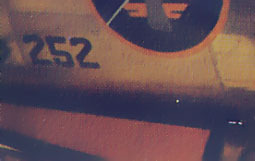 Originally as pictured above.., later a black background and yellow lettering were added to improve contrast visability. 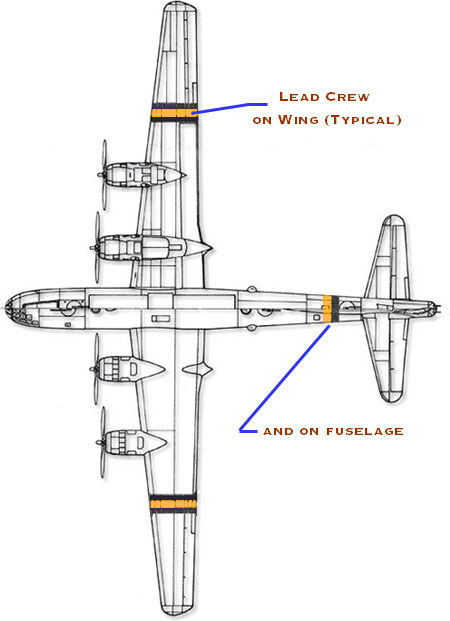 The "Lead Crew" delineation as indicated on wing tips and wrapped around rear uselage were typical after July 1945. I spoke with a gentleman who said that on one particular bombing mission, in his flight, there were six aircraft of the 330th and not one of them had the same paint scheme on tails etc. They were always experimenting with new ideas to improve visability to make it easier to form up for a bomb run. 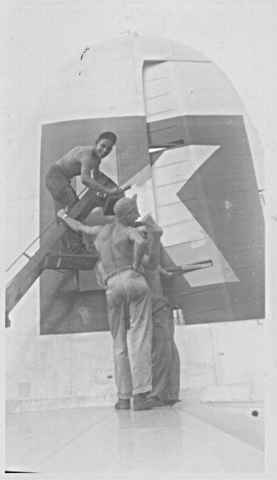 They began to put the aircraft ID number on the top and bottom of the wings in LARGE numbers as well later in the war. These were called 'buzz' numbers. Much more identifiable. 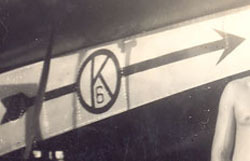 The aircraft number was again applied under the nose of the aircraft as well. 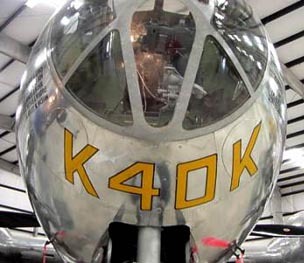 This is, of course, K-40 as seen currently in the Pima Air and Space Museum in Tucson Arizona. 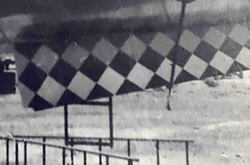 Each squadron had their own design for the nose wheel doors as well. I do not see this coming in handy in flight (too small), but maybe in directing the aircraft on the ground? Anyone who was there have any ideas? So here you have it. 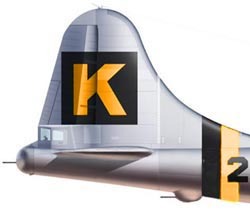 Nice bright 12' high letters on the tail.., infilled with brilliant yellow paint.., oh and one other thing., from here on out after July 1945.., all your missions would basically be flown at NIGHT. GOOD LUCK. I guess you could shine your "Aldis" lamp out the window and scan the skies for familiar aircraft? Not likely! This is where flying precisely on time, course and altitude really became key. Each aircraft was designated it's own individual "slot" to be over the target. It's own altitude, heading and time. Imagine what that planning scenario must have entailed? Towards the very end of the war the underside began to be painted a gloss black. This helped when caught in searchlights over a target on a night mission. Now.., where are the scantilly clad girls plastered to the fuselages? NOPE.., sorry. Not in this Bomb Wing mister! 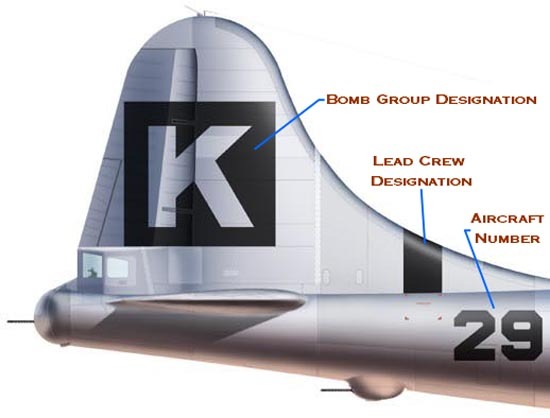 Word is.., a General Lemay himself ordered the Co-Pilot sides of the aircraft cleaned off and displayed in it's place, a 20th AF Globe Logo along with the name of a city chosen by the crew. His objective, good public relations; he expected the city so honored to 'adopt' their crew and airplane. 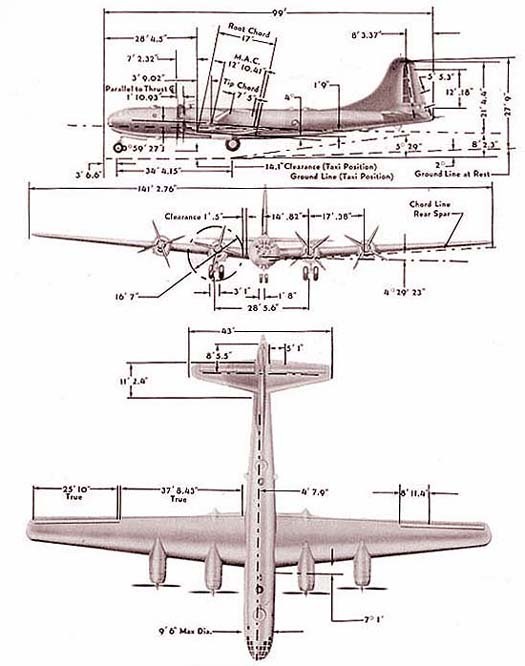 He arranged that when the crew and airplane finished their 35 missions and were rotated to the Z.I. they would be routed via the named city to be celebrated and sell war bonds. The 'girlies' on the A/C side he grudgingly allowed to stay but any 'bloodthirsty' drawings would have to be scrubbed off for fear that if the plane were shot down, the Japanese propaganda photos would reinforce the belief that we were barbarians. How the particular city was chosen varies greatly. Some have stated that it was in a lottery. As simple as pulling a name out of a hat, filled with the hometowns of the airmen. Others left it up to the home of the Aircraft Commander (A/C) or even by popular vote.